Copyright Ilan Ben Yehuda. All Rights Reserved. This photograph is a significant milestone in my life–a crossroad even. It embodies the profound inner change that occured and inspired me to take a new creative direction. This photograph is important to me. Even though it’s not my best photo and it’s far from being technically perfect, but the scene captured a decisive, meaningful, and humorous moment. I love the idea of the dog having such an intelligent look while the man looks so weird. The photo was the beginning of a series of urban animals photographs. The concept was that the animal looks in photos sometimes with human expression and behaviour. 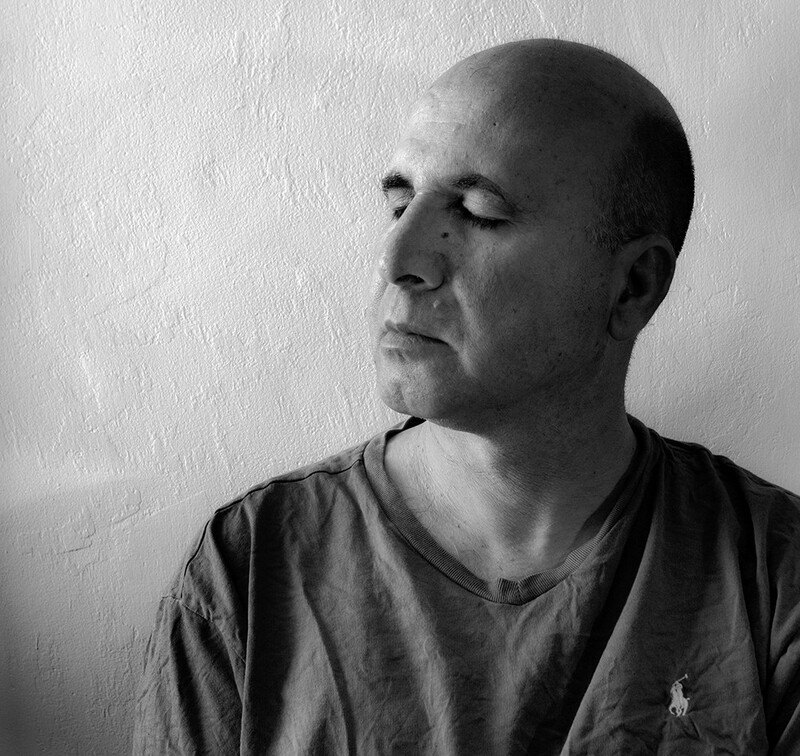 Before I took this photograph, I was concentrating on more documentary photography, capturing tough scenes and portraits near the old central station in Tel Aviv, which is where the down-and-outs and drug addicts live. I was more concerned in showing the impossible human condition, looking for humanistic stories. Today, I am more concentrated on developing a narrative by looking for street stories by playing with composition to shape an interesting and meaningful interpretation. EG: How was this photo made? 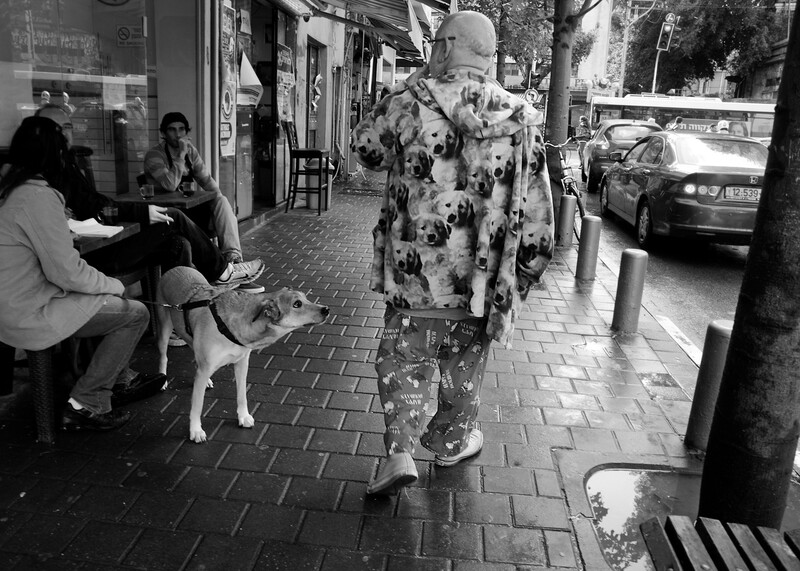 I was walking the streets, when I noticed this man wearing a jacket totally covered with dog faces. I quickly built a story in my mind about a dog that could match this guy’s strange jacket. I followed him and within two minutes I caught a break. Never imagined such a scene could happen! The dog was staring at the coat in such an odd way. This is something I really love in street photography. You can feel and expect something is going to happen and when it does, it can go far beyond all you could have ever imagined. EG: Why was this image “game-changing” for you? This image made a big change because it forced a completely new way of “seeing”. Now, photography is a quest. I find myself highly alert looking for the surreal story rather than the hardscrabble story. I changed my shooting spots to areas less dangerous. Before that, the “old station of Tel Aviv” was my main spot for shooting. Now, any place is perfect. I also started a new series of photographs in the orthodox Jewish neighbourhood in Jerusalem with this new way of thinking and looking which stimulates my creativity more than ever before. EG: How has photography itself influenced you as a person? Photography is a major part in my life. In a way, photography is my religion and my freedom. It gives me a lot of satisfaction and a lot of frustration too. It’s affects my mind. My emotions. When I have a great catch I feel high for few days. Photography also made me look at object and people differently. You look for the story behind the face and behind situation. You look deeper for light and geometrical structure, colors, and composition. But the main influence of photography on me is therapeutic; it’s a refuge from the stress of city life and makes life more meaningful. I was born and live in Ramat Gan, Israel. Working as a fashion-industry graphic designer, I have a BA in Philosophy from Hebrew University, Jerusalem. My interest in photography stretches back more than 20 years. I studied photography at Camera Obscura, Tel Aviv. Six years ago, I began to shoot intensively trying to make a meaningful street photography. See more of Ilan Ben Yehuda’s work on Black and White Street and his Urban Wildlife and Old Central Station series on Flick or follow him on Facebook. Finally a set of Lightroom compatible presets (52, to be exact) to match your single-speed fixie, bamboo-encased iPad, and life of irony. Introducing the Hipster Runoff (Vintage/Expired) preset bundle. Available for a limited time only. ELEPHANT GUN is a global, contemporary collective telling compelling stories via multimedia. ELEPHANT GUN, headquartered in Atlanta, operates across 11 countries in more than 15 cities. Follow on Instagram, Twitter, Facebook. A Global Photo Collective Telling Compelling Stories Through Multimedia. 750grain.com.